The claim: The UK’s “divorce bill” from the European Union could be as high as €60bn (£52bn). Reality Check verdict: Yes, it could. Is that likely to be the final figure? Almost certainly not. The battle over the money will begin with legal arguments but will end with hard-nosed politics. To get to any potential figure you have to work out a value for all the EU’s liabilities – the money it owes – at the point that the UK is likely to leave. Then you subtract the value of the EU’s assets, and decide what percentage of the balance is the responsibility of the UK. One way of calculating this percentage is to use the UK’s average share of EU budget contributions, which is roughly 12%. Alternatively, the European Commission might argue that the UK’s share should reflect the size of its economy, which gives a figure closer to 15%. The commission’s negotiating team has made no public comment on how it intends to calculate the cost of the divorce agreement, but there is certainly a way to get to a figure of €60bn. Some officials have said this is likely to be the initial figure that the commission will put on the negotiating table. If they do put forward that figure, the biggest part of the bill would be made up of the UK’s share of what is known as the reste a liquider (RAL), which is, in effect, the EU’s credit card bill. 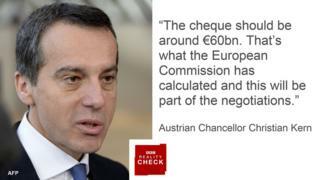 This is money that has already been committed by the EU, for which the bills have not yet been paid. By the end of 2018, it is estimated, the RAL will be more than €240bn, so the UK’s share would be substantial. Another large chunk of the potential bill is made up of money due to be spent over the next few years, much of it on big infrastructure projects in poorer EU countries. In the commission’s view, the UK has already made a legally binding promise to fund this investment, even if it happens after the UK has left. The third big item on the agenda is the cost of pension benefits for EU officials. The current total liability is €63.8bn, and the commission will expect the UK to pay its share. But if the UK has to take its share of liabilities, it is also entitled to a share of the EU’s various assets, which were worth €153.7bn at the end of 2015. Some of those could be used to offset the liabilities, including EU buildings, satellites, and even a rather nice wine cellar. Some Brexit supporters, not in government, say that the UK should pay nothing, and they point to legal opinion that backs them up. A House of Lords report concluded that Article 50 allowed the UK to leave the EU without being liable for outstanding financial obligations under the EU budget. And the campaign group Lawyers for Britain argues that it is hard to see any credible basis upon which the UK would be obliged to make net payments towards EU pensions or ongoing budget programmes. Instead, it says, the UK should seek the return of money it has paid to the European Investment Bank, which is worth €9bn. All the figures in the divorce negotiations are likely to be contentious and contested. The figure of €60bn may be politically unrealistic, but the rest of the EU will not agree a deal under which the UK walks away without paying anything. The UK could, of course, leave without any deal, although that would probably mean everyone ending up in court. If compromise can be achieved, and if payment of the bill were to be spread over many years (as pensions become payable for example), the amounts involved may not be that significant economically. But this is an issue that has the potential to cause bitter political fights.